You know the phrase “it’s all about the people you know?” That phrase used to really get on my nerves because I didn’t understand what it meant, and I also didn’t know anybody. It wasn’t until I started really networking that I began to understand what it meant. I began pouring more of myself into networking after learning just how powerful word of mouth is. The more I networked, the more I met people who became my cheerleaders. Finding the right people who advocate for my work and sing my praises (for free!) has been monumental in bringing me business– and that’s why I committed myself to it. Once you start getting to know people, things start happening–– in your professional life and in your personal life. When I really dove in and committed myself to networking, I quickly started meeting people who I could just feel were the right people. I’ve been building relationships with these people since then, and the byproduct of me doing so has been more clients, more exposure, and more people singing my praises. How cool is that? Building good relationships takes time and intentionality–– but it’s time, energy, and money well-invested if you do it well. Networking isn’t new - you already network! Everyone you know and associate with is your network––family, friends, neighbors, coworkers, business associates, religious congregations, clubs, etc. Everyone you know also has their own network. Networking is simply getting to know people with intentionality and building an asset based on relationships. No matter the job you work (or whether you work at all), we all deal with people in one way or another for our means in life. And we all rely on each other to supply our substance in life. You are in business because you want to provide something for humans––even if at the end of the day that human is yourself. It’s important not to think of networking as a business strategy because when you begin to see it as means to an end, you also begin treating people as means to an end. Success out of networking comes from building relationships––not ruining them. It takes the support of many for one person to achieve something. People support you when they know and relate to you. People are more willing to know and relate to you when you take the time and energy to get to know them. Relationship-building takes time and commitment, but if you are willing to make that investment into networking and genuinely open yourself to helping other people, you will reap the rewards. If you’ve ever been to a networking event before, you’ve probably met an over-eager business card collector who is clearly measuring the success of their networking efforts on how many cards they can collect. The truth is that it doesn’t matter how many business cards you can collect. What matters is what you build with the person who handed you the card. What motivation does a person have to help you if all you’ve done for them is taken their business card? To succeed, it’s crucial to have a giver’s gain mindset because without it the value of your network will dry up. How you treat people matters. What you have to offer matters. When you show that you value a person, they’re far more motivated to show you that they value you back. The value of this relationship compounds over time, and then you end up with more than just a business connection––you end up with new partnerships, more revenue in your business, even friendships, and a world of new opportunities. 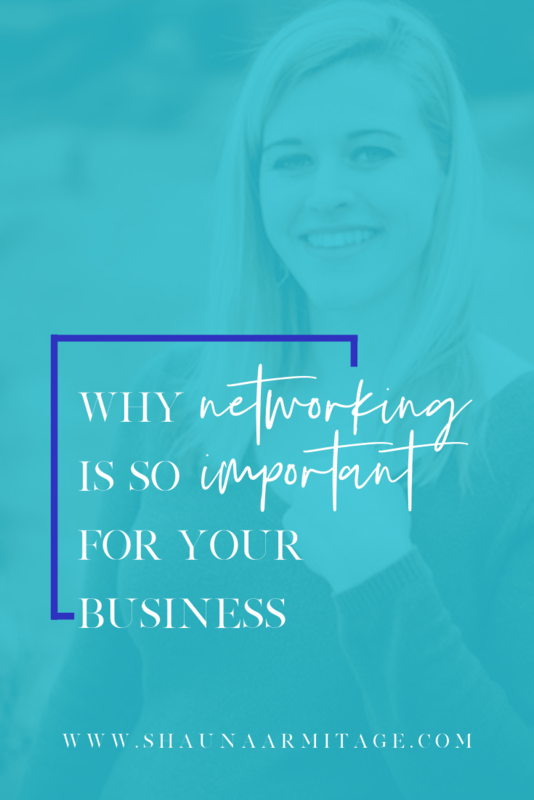 While networking is a long-term investment in your business, it doesn’t take much to stay relevant and connected in someone else’s network. After you’ve sat down and met with someone, always make sure you follow up. You can mention you’d like to set up another meeting, invite them to an event, or introduce them to someone else they might be interested to meet. Show them you want to stay in touch. We all live busy lives, but we have to stay in touch somehow as networkers. Social networks make this incredibly efficient. Sending the occasional direct message to say hello or liking or commenting on posts are great ways to stay in touch with a person and for them to keep you in mind. When you stay in touch with people, you’re always building more potential opportunities for your business to succeed. Building relationships means always having something cooking! Don’t neglect networking as part of your marketing efforts. While it takes a lot of time and hands-on commitment, the rewards are well worth it if you’re willing to do things right. Effective networking starts with a genuine desire to help others succeed and develop enriching relationships. Anya is a content creator, marketer, advocate, and Humanist from St. Louis, Missouri. When she’s not marketing her Uncle’s gymnastics business or teaching gymnastics herself, she’s busy running her own business. Anya provides digital marketing and content services to small businesses. She’s on a mission to empower others to affect change using their voices, not only in business but in all aspects of life. Anya loves to travel and is active in Humanist communities internationally. She’s a vocal advocate of human rights, science and reason, and social justice. Anya’s long-term goal is to become a digital nomad and roam the world freely while promoting Humanist values through her business.